Houston auto interior detailing near Sugar Land, TX. A car is a tool and it could also be an investment. A car gets us from place to place. Therefore a significant amount of your time is spent behind the wheel. As a result it can become strenuous for you and your vehicle. Similarly, it is natural for the interior of your car to get cluttered and dirty. Auto interior detailing is a good solution. For instance auto interior detailing delivers a good thorough cleaning to a drastic complete carpet & seat removal. In addition auto interior detailing can restore the inside of your car to a like-new condition. Wax Works Auto Detail has been providing interior detailing to Sugar Land, Missouri City, Stafford, and Southwest Houston, TX since 1981. Stress affects our health. Dust and dirt create poor air quality in the interior of your vehicle. Avoid hazardous allergens like mold and mildew with a professional interior detail. Doing so can clean your car interior which will also promote your mental health, as well. Our car is both a tool and a potential asset. A car that is in great cosmetic condition will give you immediate benefits and be more appealing to buyers. A dirty interior not only creates a clutter it can also develop nauseating odor(s). 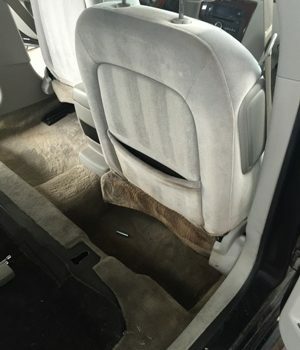 Houston Auto interior detailing helps remove odors.